After finally closing a game out in the fourth quarter and snapping a ten game divisional losing streak, the Chargers are not finished yet. Realistically, it’s still a long shot for the Chargers to come back and make a run at the playoffs, but after the division leaders both losing this past week, they sit only two games out of the lead. If they do expect to be competitive they need to win at least one of their tough next two games against teams who are a combined 8-4, and both games are on the road. This week we get a matchup we don’t often see as the Chargers (2-4) head to the Georgia Dome to take on the Falcons (4-2). This is only the tenth meeting between the two teams, and the Falcons have won nine of them, including six straight, but the teams play so rarely that many players from their last game in 2012 are not on the roster anymore. This year Atlanta has been one of the best teams in the league, so this will be a true test to see if the Bolts have really turned a corner. The Falcons offense has been dynamic this season averaging 441.5 yards and 33.2 points per game, ranking first in the league in both categories. They have been slowed a bit in their last two games, averaging only 23.5 points, against two of the best defenses in the league. Quarterback Matt Ryan has had the best start of his career and has thrown only three interceptions compared to 15 touchdowns, and leads the league in passer rating and QBR. It sure helps to have a guy named Julio Jones, who already has a game this season with 300 receiving yards, yes 300. Jones has only two touchdowns this season, but even when he isn’t putting up outstanding numbers, he is drawing a huge amount of attention from every defense, and opening opportunities for the rest of the offense. The Falcons have used two running backs consistently this season with Devonte Freeman getting the bulk of the carries, averaging 5.0 yards per carry and Tevin Coleman has been the better pass catcher with 18 receptions, averaging 17.8 yards per catch. 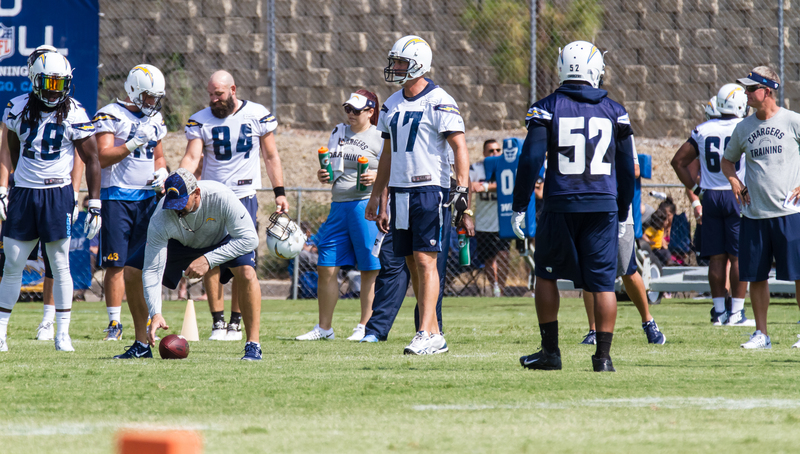 On offense for the Chargers this week, look for bounce back games for receivers Tyrell Williams and Travis Benjamin. After facing one of the best secondaries in the league, they now face a defense allowing the sixth-most passing yards in the NFL (285.3), and I expect at least one of these two to hit the 100-yard mark. Travis Benjamin suffered an injury in practice this week, however, so he is questionable for the game, but should play well if he is out there. Philip Rivers should also have more success this week, especially going down the field, as Atlanta’s pass rush is nowhere near what they faced against the Broncos. Melvin Gordon had a career long 48-yard run last week, but the Chargers haven’t had enough big plays in the running game. According to sportingcharts.com Melvin Gordon has only seven rushes of ten or more yards, which ranks 22nd amongst running backs. This is as much on the offensive line as it is on Gordon, but if the line can stay healthy, it should be more cohesive as the season progresses and that should lead to bigger holes, like the one against Denver. The Falcons hired Dan Quinn to help improve the defensive side of the ball, but so far he hasn’t been able to replicate the success he found as Seattle’s defensive coordinator. The Falcons have given up 26 or more points in every game except for one, and have given up an average of 27.7 points per game. One of the main problems has been the inability to force turnovers, with only six, but they are about to take on a team that has given the ball away 13 times already this season. Vic Beasley has provided the pass-rush so far for the Falcons, pacing the team with 4.5 sacks and second on the team is former Charger, Dwight Freeney who has 3.0. The Falcons have struggled to get pressure so far with only 11.0 sacks on the season, and six of those came in their game against rookie quarterback Paxton Lynch and the Broncos. One player that stands out in their secondary is Desmond Trufant, who is the Falcons best cover corner and does a bit of everything for this team with 2.0 sacks, a forced fumble and an interception through week 6. The Chargers’ defense had one of its best games last week against, holding Denver to only 13 points and carrying the team in the second half, with Rookies Jatavis Brown and Joey Bosa looking better than anyone expected. They only had one sack, but they forced holding calls all night, causing a safety on one play and brought back a touchdown on another. This week they have the task of slowing down Matt Ryan, and the best offense in the league so far, and they will again be without starters Brandon Flowers and Jahleel Addae. The Chargers will need to get pressure to have success as the Falcons have allowed 3.5 sacks in their two losses while giving up only 2.0 sacks per game in victories. The Chargers secondary is very inexperienced outside of Casey Hayward, so expect him to see a lot of Julio Jones this week as he is San Diego’s best corner now with the absence of Jason Verrett. The Bolts will try and continue their stout run defense, as they are top five in the NFL at stopping the run this season after being dreadful in 2015. One reason they have been so much better is they have been leading most of their games, but the other is Brandon Mebane who has been worth every penny and will be needed against a team averaging 112 rushing yards per game. The Chargers are going cross-country to Atlanta as 6.5 point underdogs and almost no “expert” has picked them to win, but in the past, we have seen the Bolts start slow and turn things around. I believe that the Chargers defense is playing as well as it has all season, and the Chargers seem to have some momentum even with only two wins. They seem to lose games they should win, and win games they should lose so the Chargers find a way this week and win 31-27.